RFID (Radio Frequency Identification) is an automatic identification system to exchange information via wireless communications with an RFID tag containing ID information. Generally, it refers to an IC tag. 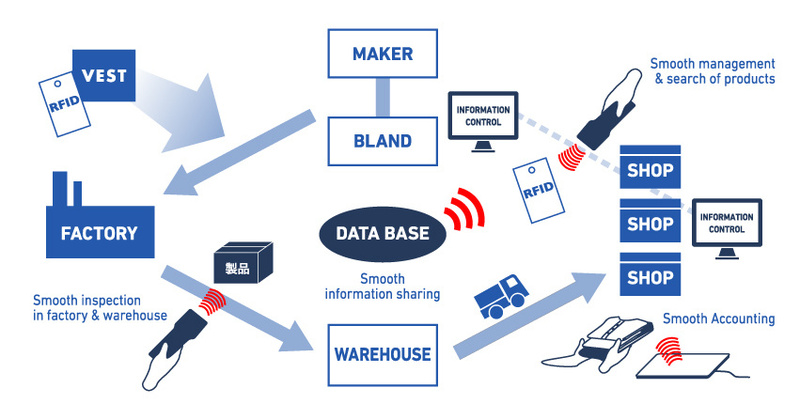 Compared with barcode tags, RFID tags help improve the operational efficiency drastically. Now, small and high-performance tags are available at low prices. Vest provides, prints and encodes hang tags and labels containing IC chips, critical for an RFID system, and supports the operation of the system. We have a high-speed single tag printer and a roll printer. We offer various types of RFID tags to be chosen according to individual customer needs. All-in-one type is the existing brand tag with IC chip embedded. Sticky label type is to be stuck on the existing tag. Plus-one type is a RFID tag to be attached separately from the existing tag.